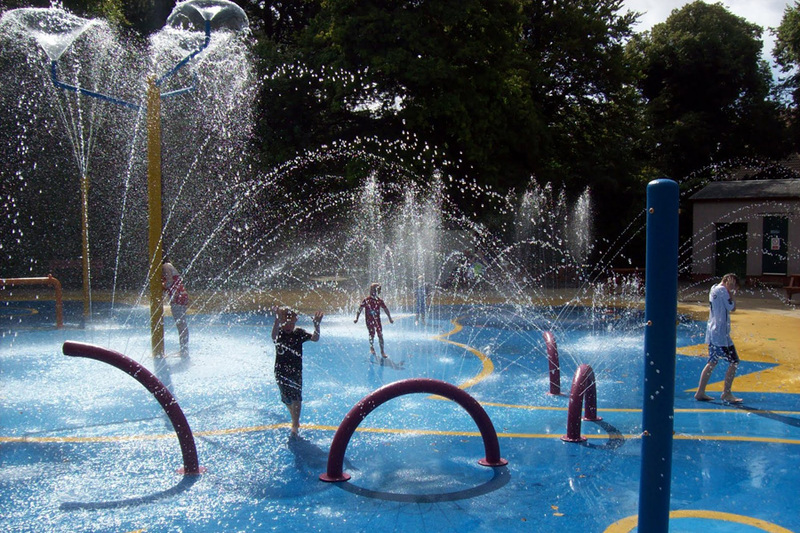 For children’s summer fun in the sun come to Happy Mount Park’s Splash Park to cool down in the interactive sprinkler area. If hot days make your kids long to run through the cooling water of a lawn sprinkler then the Splash Park will exceed their expectations! Multiple water jets are activated by movement, so children of all abilities will be able to activate the sensor operated water jets on this brightly coloured interactive installation. The Splash Park at Happy Mount Park is built on an outdoor soft play surface, so wheelchair users can access the fun. Get ready to get wet though, because once you’re in the splash zone there will be water everywhere! Summer fun in Happy Mount Park can last all day long, so in between splash sessions you can rehydrate at our ice cream vans, located throughout the park, selling a range of cold beverages, ice lollies, and delicious Lewis’s Ice Cream. For snacks, hot drinks, more substantial meals, and picnics, visit the café in the park. You can find specialty coffee and tea, daily home-cooked specials, children’s meals, and cakes at Café Rastelli, all available to takeaway for a picnic in the park! For a flavour of Morecambe’s leisure history, the swing boats and a children’s roundabout have been fully restored and are available for use. If the weather doesn’t suit outdoor play, then indoor soft play can be found at Pirates in the Park, located in the cafe complex. Ball pools, climbing frames, and a bouncy pirate galleon will delight children ages 1 to 10, all year round, rain or shine! From May 2017 a new system will be brought in to control access to the Splash Park in Morecambe. From this date entry to the Splash Park will cost £1 per person (including adults) for one of the 4 daily sessions. Sessions can be booked in advance on the day and users will be provided with a date stamped coloured wristband after booking at the park kiosk. Sessions are limited to 400 people so that we don’t exceed a safe capacity, as well as not putting too much of a demand on the pool system itself. The Splash Park operates a very similar system as at other swimming facilities, so the water is filtered and chlorine added to keep it clean and safe. If too many people use the facility at one time, the water can’t process fast enough!